In the divine lineage of Swami Shri Haridasji, Gaurav Krishnaji was born on July 6, 1984 to Shradhey Mridul Krishna Goswamiji and Shrimati Vandana Goswamiji in Shri Dham Vrindavan, India. Born into a Vaishnav family of Acharyas, he has taken on the responsibilities as a messenger of God, and has carried on the teachings of his family by humbly following in their footsteps. 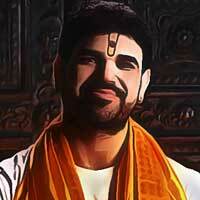 At the young age of 18, Gauravji narrated his first Bhagwat Katha. Amongst thousands of devotees he recited from his heart for seven days this revered scripture that has been in his family for several generations. Since then Gauravji has traveled throughout Inda and internationally spreading the love and devotion for Shri Radha Krishna and has entered the hearts of millions of followers by showing them the true path of "bhakti". His approach to devotion is easily understood and appreciated by all. The charm of his narration lies in his simplicity and his complete devotion for Bihariji. The most adored part of experiencing his devotion is when he brings to life all the past times or "leelas" of Shri Krishna, and creates amongst us the serene atmosphere of Vrindavan. It feels as if an incessant stream of nectar is flowing from the heart and lips of Shri Shukdevji himself. No matter how many times you may have the privilege of listening to his katha, every time he gives it a totally new and refreshed dimension,where you feel as if you are experiencing it for the first time. It is only here where one can attain "true bliss" or "Anand" that our soul needs in today's materialistic world. His way of reciting the Shrimad Bhagwat coupled with his melodious bhajans takes you into a world of serenity and peace where no matter what part of the world you may be in, you feel as though you are sitting in Shri Dham Vrindavan. Being the descendents of "Sangeet Samrat" Swami Shri Haridasji, the knowledge of classical music runs in this divine family. With his nectar like voice, Gauravji has enlightened millions with his world renowned bhajans, and his musical approach has you longing for more with a desire to hear the glories of Shyama Shyam in his divine voice to no end. Several of his tapes have become so popular and are played and sung by devotees across the world. The most popular being "Braj Chourasi Kos Yatra", which is inspiring because of its unique concept and recitation of which makes you feel as if you are actually traveling throughout Braj Bhoomi chanting the glorious name of Shri Radha Rani. Additionally "Radhe Sadha Mujh par" has made a mark and most recently, "Shyam Diyan Chor Ankhiyan", which is the first album to be released in a regional language, due to immense demand this album was released in Punjabi. At such a young age, Gauravji has managed to influence not only the elderly but the youth as well. At his age normally people have different interests and a very different perspective on life, but with the unconditional love and blessings of his elders, he has not only managed to carry on the spiritual tradition but has accepted with all his heart and will to dedicate his life to travel the world with only 1 mission: to create the garden of "Vrindavan" in the hearts of his listeners, and spread the glorious "Radha Naam". We are all very fortunate to have amongst us a soul like Acharya Gaurav Krishnaji with whom we can be enlightened and experience the presence of the divine in our daily lives. © 2016-20 Bhagwat Mission. All Rights Reserved.